For a summary of the script and its use in writing systems, see the page Tibetan script summary. For similar information related to other scripts, see this list. 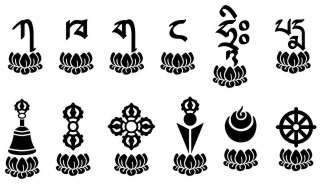 We have usage data for the following 2 languages that use the Tibetan script: Dzongkha, Tibetan. ká, eg, དཀར་པོ་ dkar-po karpo (white). Used with subscripts, ཀྱ kja, ཀྲ tra, ཀླ la, སྐ ka. Subjoined form is ྐ [U+0F90 TIBETAN SUBJOINED LETTER KA]. kʰá eg. ཁ་ཁེབ་ kha-kheb kʰa-kʰep (cover). Used with subscripts, ཁྱ kʰja, ཁྲ tʰra, ཁྭ ka. Subjoined form is ྑ [U+0F91 TIBETAN SUBJOINED LETTER KHA]. Used as a prefix with 11 consonants. g when used as a suffix, eg. དག་ dag dag (I). Used with subscripts, གྱ gja, གྲ dra, བླ la, གྭ ga.
Subjoined form is ྒ [U+0F92 TIBETAN SUBJOINED LETTER GA]. Used to represent an aspirated consonant in transcription/transliteration of non-Tibetan words. Can be written using ྒ U+0F92 TIBETAN SUBJOINED LETTER GA and ྷ [U+0FB7 TIBETAN SUBJOINED LETTER HA] . The Unicode Standard recommends using this precomposed form, but many applications silently normalise this to two characters. Subjoined form is ྒྷ [U+0F93 TIBETAN SUBJOINED LETTER GHA]. ŋ when used as a suffix. Followed by tsek when it occurs before a shay, eg. དང༌།. Unicode Standard recommends use of ༌ [U+0F0C TIBETAN MARK DELIMITER TSHEG BSTAR] to prevent line breaks between the tsek and the shay. Subjoined form is ྔ [U+0F94 TIBETAN SUBJOINED LETTER NGA]. Subjoined form is ྕ [U+0F95 TIBETAN SUBJOINED LETTER CA]. Subjoined form is ྖ [U+0F96 TIBETAN SUBJOINED LETTER CHA]. Subjoined form is ྗ [U+0F97 TIBETAN SUBJOINED LETTER JA]. Used with subscript ཉྭ ɲa. Subjoined form is ྙ [U+0F99 TIBETAN SUBJOINED LETTER NYA]. Used for transcribing other languages, and also to distinguish foreign loan words from sequences of Tibetan syllables, eg. མོ་ཊ་ mo-ṭa (car). The shape is a reversed version of ཏ [U+0F4F TIBETAN LETTER TA]. Subjoined form is ྚ [U+0F9A TIBETAN SUBJOINED LETTER TTA]. Used for transcribing other languages, and also to distinguish foreign loan words from sequences of Tibetan syllables. The shape is a reversed version of ཐ [U+0F50 TIBETAN LETTER THA]. Subjoined form is ྛ [U+0F9B TIBETAN SUBJOINED LETTER TTHA]. Used for transcribing other languages, and also to distinguish foreign loan words from sequences of Tibetan syllables, eg. ཁ་ཎ་ཌ་ kha-ṇa-ḍa (Canada). The shape is a reversed version of ད [U+0F51 TIBETAN LETTER DA]. Subjoined form is ྜ [U+0F9C TIBETAN SUBJOINED LETTER DDA]. Used for transcribing other languages. Can be written using ཌ [U+0F4C TIBETAN LETTER DDA] and ྷ [U+0FB7 TIBETAN SUBJOINED LETTER HA] . The Unicode Standard recommends using this precomposed form, but many applications silently normalise this to two characters. The shape is a reversed version of དྷ [U+0F52 TIBETAN LETTER DHA]. Subjoined form is ྜྷ [U+0F9D TIBETAN SUBJOINED LETTER DDHA]. The shape is a reversed version of ན [U+0F53 TIBETAN LETTER NA]. Subjoined form is ྞ [U+0F9E TIBETAN SUBJOINED LETTER NNA]. Used with subscript ཏྲ tra. Subjoined form is ྟ [U+0F9F TIBETAN SUBJOINED LETTER TA]. Used with subscript ཐྲ tʰra. Subjoined form is ྠ [U+0FA0 TIBETAN SUBJOINED LETTER THA]. Used as a prefix with 6 consonants, eg. དགའ་ dga gà (virtue). Modifies the root vowel when used as a suffix, eg. བསད་ bsad sɛ́ (killed). Until the 19th century, was used as a silent secondary suffix, but not officially in modern Tibetan, eg. གྱུརད་ gyurd kjùr (became). Used with subscripts, དྲ dra, དྭ da. Subjoined form is ྡ [U+0FA1 TIBETAN SUBJOINED LETTER DA]. Can be written using ད [U+0F51 TIBETAN LETTER DA] and ྷ [U+0FB7 TIBETAN SUBJOINED LETTER HA] . The Unicode Standard recommends using this precomposed form, but many applications silently normalise this to two characters. Subjoined form is ྡྷ [U+0FA2 TIBETAN SUBJOINED LETTER DHA]. n when used as a suffix, but it also modifies the root vowel, eg. བདུན་ bdun dỳn (seven). Used with subscript ནྲ na. Subjoined form is ྣ [U+0FA3 TIBETAN SUBJOINED LETTER NA]. Used with subscripts, པྱ cja, པྲ tra, eg. སྤྱིར་ spyir ʧí (general). Subjoined form is ྤ [U+0FA4 TIBETAN SUBJOINED LETTER PA]. Used with subscripts, ཕྱ cʰja, ཕྲ tʰra. Subjoined form is ྥ [U+0FA5 TIBETAN SUBJOINED LETTER PHA]. Used as a prefix before 10 consonants. b when used as a suffix, eg. བསྒྲུབས་ bsgrubs ɖɹúb (established). Used with subscripts, བྱ ʤja, བྲ tra, བླ la. Subjoined form is ྦ [U+0FA6 TIBETAN SUBJOINED LETTER BA]. Can be written using བ [U+0F56 TIBETAN LETTER BA] and ྷ [U+0FB7 TIBETAN SUBJOINED LETTER HA] . The Unicode Standard recommends using this precomposed form, but many applications silently normalise this to two characters. Subjoined form is ྦྷ [U+0FA7 TIBETAN SUBJOINED LETTER BHA]. Used as a prefix before 11 consonants. m when used as a suffix, eg. འགྲེམས་སྟོན་ 'grems-ston ɖɹem-ton (exhibition). Used with subscripts, མྱ ɲa, མྲ ma. Subjoined form is ྨ [U+0FA8 TIBETAN SUBJOINED LETTER MA]. Used with subscript ཙྭ tsa. Subjoined form is ྩ [U+0FA9 TIBETAN SUBJOINED LETTER TSA]. Used with subscript ཚྭ ʧa. Subjoined form is ྪ [U+0FAA TIBETAN SUBJOINED LETTER TSHA]. Subjoined form is ྫ [U+0FAB TIBETAN SUBJOINED LETTER DZA]. Can be written using ཛ [U+0F5B TIBETAN LETTER DZA] and ྷ [U+0FB7 TIBETAN SUBJOINED LETTER HA] . The Unicode Standard recommends using this precomposed form, but many applications silently normalise this to two characters. Subjoined form is ྫྷ [U+0FAC TIBETAN SUBJOINED LETTER DZHA]. Subjoined form is ྭ [U+0FAD TIBETAN SUBJOINED LETTER WA]. See also ྺ [U+0FBA TIBETAN SUBJOINED LETTER FIXED-FORM WA]. Used with subscript ཞྭ zʰa. Subjoined form is ྮ [U+0FAE TIBETAN SUBJOINED LETTER ZHA]. Used with subscripts, ཟླ da, ཟྭ za. Subjoined form is ྯ [U+0FAF TIBETAN SUBJOINED LETTER ZA]. Used as a prefix before 10 consonants, eg. འཁོར་ལོ་ 'khor-lo kor-lo (wheel). a when used as a suffix. May also nasalise the juncture of two morphemes, as in དགེ་འདུན་ dge-'dun (buddhist community), pronounced ɡenyn. Can be used as a base for dependent vowel signs, in which case the a sound is replaced by that of the vowel. It has a low tone (cf. ཨ [U+0F68 TIBETAN LETTER A]). Other than loanwords, Tibetan only allows diphthongs in diminutive expressions. 'A-chung is used to write these, as in the following: མི་ mi person > མེའུ་ me'u dwarf; རྡོ་ rdo stone > རྡེའུ་ rde'u pebble. Can be used to disambiguate the location of an inherent vowel in a syllable. The sequence དག་ dag dàg (I) is interpreted as CVC. To express CCV add 'a-chung, eg. དགའ་ dga gà (virtue). Subjoined form is ྰ [U+0FB0 TIBETAN SUBJOINED LETTER -A]. Subjoined form is ྱ [U+0FB1 TIBETAN SUBJOINED LETTER YA]. rà, eg. རེ་བ་ re-ba re-wa (hope). r when used as a suffix, eg. འཁོར་ལོ་ 'khor-lo kor-lo (wheel). Used as a superscript with 13 consonants, རྐ ka རྒ ga རྔ ŋa རྗ ʤa རྙ ɲa རྟ ta རྡ da རྣ na རྦ ba རྨ ma རྩ tsa རྫ dza རླ la རྭ ra. Subjoined form is ྲ [U+0FB2 TIBETAN SUBJOINED LETTER RA]. See also ཪ [U+0F6A TIBETAN LETTER FIXED-FORM RA]. l when used as a suffix, but also modifies the root vowel value. Used as a superscript with 11 consonants, ལྐ ka ལྒ ga ལྔ ŋa ལྕ ca ལྗ ʤa ལྟ ta ལྡ da ལྤ pa ལྦ ba ལྷ lha ལྭ la . Subjoined form is ླ [U+0FB3 TIBETAN SUBJOINED LETTER LA]. Used with subscript ཤྭ ʃa. Subjoined form is ྴ [U+0FB4 TIBETAN SUBJOINED LETTER SHA]. The shape is a reversed version of ཤ [U+0F64 TIBETAN LETTER SHA]. Subjoined form is ྵ [U+0FB5 TIBETAN SUBJOINED LETTER SSA]. When used as a suffix modifies the root vowel's value. Only two characters can appear in the secondary suffix location, according to Tibetan grammar, and ས is one. A character in this position adds no sound, nor does it affect the sounds in the rest of the syllable, eg. བསྒྲུབས་ bsgrubs ɖɹúb (established). Used as superscript with 13 consonants, སྐ ka སྒ ga སྔ ŋa སྙ ɲa སྟ ta སྡ da སྡ na སྤ pa སྦ ba སྨ ma སྩ tsa སྲ sa སླ la. Subjoined form is ྶ [U+0FB6 TIBETAN SUBJOINED LETTER SA]. Used with subscripts, ཧྱ hja, ཧྲ hra, ཧྭ ha. Subjoined form is ྷ [U+0FB7 TIBETAN SUBJOINED LETTER HA]. Used as a base for dependent vowels, with a high tone (cf. འ [U+0F60 TIBETAN LETTER -A]). Subjoined form is ྸ [U+0FB8 TIBETAN SUBJOINED LETTER A]. Used for transcription/transliteration of foreign text. Should be written using ཀ [U+0F40 TIBETAN LETTER KA] and ྵ [U+0FB5 TIBETAN SUBJOINED LETTER SSA] . Subjoined form is ྐྵ [U+0FB9 TIBETAN SUBJOINED LETTER KSSA]. Used only in transliteration of non-Tibetan texts, not in normal Tibetan text. ར [U+0F62 TIBETAN LETTER RA] at the top of a stack usually has a reduced form, eg. རྐ rka. For transliterations it is sometimes desirable to retain the full form of RA where in Tibetan words it would be reduced. To do this use this character instead of the normal RA, but only where the normal RA would not produce the full form anyway, ie. do not use eg. རྙ rnya, which has the full form already. Standard form is ར [U+0F62 TIBETAN LETTER RA]. See also ྼ [U+0FBC TIBETAN SUBJOINED LETTER FIXED-FORM RA]. Used with superscripts, རྐ ka, ལྐ ka, སྐ ka, eg. སྐར་ཆ་ skar-cha karcʰe (second). Head form is ཀ [U+0F40 TIBETAN LETTER KA]. Head form is ཁ [U+0F41 TIBETAN LETTER KHA]. Used with superscripts, རྒ ga, ལྒ ga, སྒ ga.
Head form is ག U+0F42 TIBETAN LETTER GA.
Can be written using ྒ [U+0F92 TIBETAN SUBJOINED LETTER GA] and ྷ [U+0FB7 TIBETAN SUBJOINED LETTER HA] . The Unicode Standard recommends using this precomposed form, but many applications silently normalise this to two characters. Head form is གྷ [U+0F43 TIBETAN LETTER GHA]. Used with superscripts, རྔ ŋa, ལྔ ŋa, སྔ ŋa. Head form is ང [U+0F44 TIBETAN LETTER NGA]. Used with superscript ལྕ ʧa. Head form is ཅ [U+0F45 TIBETAN LETTER CA]. Head form is ཆ [U+0F46 TIBETAN LETTER CHA]. Used with superscript རྗ ʤa. Head form is ཇ [U+0F47 TIBETAN LETTER JA]. Used with superscript རྙ ɲa . This cluster is unusual in that ར [U+0F62 TIBETAN LETTER RA] above it keeps its full form. Head form is ཉ [U+0F49 TIBETAN LETTER NYA]. Head form is ཊ [U+0F4A TIBETAN LETTER TTA]. Head form is ཋ [U+0F4B TIBETAN LETTER TTHA]. Head form is ཌ [U+0F4C TIBETAN LETTER DDA]. Can be written using ྜ [U+0F9C TIBETAN SUBJOINED LETTER DDA] and ྷ [U+0FB7 TIBETAN SUBJOINED LETTER HA] . The Unicode Standard recommends using this precomposed form, but many applications silently normalise this to two characters. Head form is ཌྷ [U+0F4D TIBETAN LETTER DDHA]. Head form is ཎ [U+0F4E TIBETAN LETTER NNA]. Used with superscripts, རྟ ta, ལྟ ta, སྟ ta. Head form is ཏ [U+0F4F TIBETAN LETTER TA]. Head form is ཐ [U+0F50 TIBETAN LETTER THA]. Used with superscripts, རྡ da, ལྡ da, སྡ da. Head form is ད [U+0F51 TIBETAN LETTER DA]. Can be written using ྡྷ [U+0FA2 TIBETAN SUBJOINED LETTER DHA] and ྷ [U+0FB7 TIBETAN SUBJOINED LETTER HA] . The Unicode Standard recommends using this precomposed form, but many applications silently normalise this to two characters. Head form is དྷ [U+0F52 TIBETAN LETTER DHA]. Used with superscript རྣ na. Head form is ན [U+0F53 TIBETAN LETTER NA]. Used with superscripts, ལྤ pa, སྤ pa.
Head form is པ [U+0F54 TIBETAN LETTER PA]. Head form is ཕ [U+0F55 TIBETAN LETTER PHA]. Used with superscripts, རྦ ba, ལྦ ba, སྦ ba. Head form is བ [U+0F56 TIBETAN LETTER BA]. Can be written using ྦ [U+0FA6 TIBETAN SUBJOINED LETTER BA] and ྷ [U+0FB7 TIBETAN SUBJOINED LETTER HA] . The Unicode Standard recommends using this precomposed form, but many applications silently normalise this to two characters. Head form is བྷ [U+0F57 TIBETAN LETTER BHA]. Used with superscripts, རྨ ma, སྨ ma. Head form is མ [U+0F58 TIBETAN LETTER MA]. Used with superscripts, རྩ tsa, སྩ tsa. Head form is ཙ [U+0F59 TIBETAN LETTER TSA]. Head form is ཚ [U+0F5A TIBETAN LETTER TSHA]. Used with superscript རྫ dza. Head form is ཛ [U+0F5B TIBETAN LETTER DZA]. Can be written using ྫ [U+0FAB TIBETAN SUBJOINED LETTER DZA] and ྷ [U+0FB7 TIBETAN SUBJOINED LETTER HA] . The Unicode Standard recommends using this precomposed form, but many applications silently normalise this to two characters. Head form is ཛྷ [U+0F5C TIBETAN LETTER DZHA]. Used as a subscript with 13 consonants: ཀྭ ka ཁྭ ka གྭ ga ཉྭ ɲa དྭ da ཙྭ tsa ཚྭ ʧa ཞྭ zʰa ཟྭ za རྭ ra ལྭ la ཤྭ ʃa ཧྭ ha . Uniquely, WA can also appear as a sub-subscript, as in གྲྭ་ grwa. Head form is ཝ [U+0F5D TIBETAN LETTER WA]. Head form is ཞ [U+0F5E TIBETAN LETTER ZHA]. Head form is ཟ [U+0F5F TIBETAN LETTER ZA]. A subjoined 'a-chung is used to express long vowels in loan words (Tibetan doesn't have them natively), such as those borrowed from Chinese, Hindi and Mongolian. For example, ཏཱ་བླ་མ་ tā-bla-ma (grand lama) (ta from Chinese), and ཤྲཱི་ shrī (wealth) from Sanskrit. For this purpose you should use ཱ [U+0F71 TIBETAN VOWEL SIGN AA], and not ྰ [U+0FB0 TIBETAN SUBJOINED LETTER -A]. The Unicode Standard says of SUBJOINED LETTER -A: "U+0FB0 TIBETAN SUBJOINED LETTER -A ( a-chung ) should be used only in the very rare cases where a full-sized subjoined a-chung letter is required. The small vowel lengthening a-chung encoded as U+0F71 TIBETAN VOWEL SIGN AA is far more frequently used in Tibetan text, and it is therefore recommended that implementations treat this character (rather than U+0FB0) as the normal subjoined a-chung". Head form is འ [U+0F60 TIBETAN LETTER -A]. Used as a subscript with 14 consonants, ཀྱ kja ཁྱ kʰja གྱ gja པྱ cja ཕྱ cʰja བྱ ʤja མྱ ɲa ཧྱ hja ཀྲ tra ཁྲ tʰra གྲ dra ཏྲ tra ཐྲ tʰra དྲ dra ནྲ na . Head form is ཡ [U+0F61 TIBETAN LETTER YA]. See also ྻ [U+0FBB TIBETAN SUBJOINED LETTER FIXED-FORM YA]. Used as a subscript with 13 consonants, ཀྲ tra ཁྲ tʰra གྲ dra ཏྲ tra ཐྲ tʰra དྲ dra ནྲ na པྲ tra ཕྲ tʰra བྲ tra མྲ ma སྲ sa ཧྲ hra. Head form is ར [U+0F62 TIBETAN LETTER RA]. Used as a subscript with 6 consonants, ཀླ la གླ la བླ la རླ la སླ la ཟླ da . Head form is ལ [U+0F63 TIBETAN LETTER LA]. Head form is ཤ [U+0F64 TIBETAN LETTER SHA]. Head form is ཥ [U+0F65 TIBETAN LETTER SSA]. Head form is ས [U+0F66 TIBETAN LETTER SA]. Used with superscript ལྷ lha. Head form is ཧ [U+0F67 TIBETAN LETTER HA]. Head form is ཨ [U+0F68 TIBETAN LETTER A]. Should be written using ྐ [U+0F90 TIBETAN SUBJOINED LETTER KA] and ྵ [U+0FB5 TIBETAN SUBJOINED LETTER SSA] . Head form is ཀྵ [U+0F69 TIBETAN LETTER KSSA]. Used in transliteration of non-Tibetan texts, not in normal Tibetan text. See also ྭ [U+0FAD TIBETAN SUBJOINED LETTER WA]. See also ྱ [U+0FB1 TIBETAN SUBJOINED LETTER YA]. A subjoined 'a-chung is used to express long vowels in loan words (Tibetan doesn't have them natively), such as those borrowed from Chinese, Hindi and Mongolian. For example, ཏཱ་བླ་མ་ tā-bla-ma (grand lama) (ta from Chinese), and ཤྲཱི་ śrī (wealth) from Sanskrit. For this purpose you should use ཱ [U+0F71 TIBETAN VOWEL SIGN AA], and not ྰ [U+0FB0 TIBETAN SUBJOINED LETTER -A]. Combination used for Sanskrit transcriptions. Do not use. Use instead ཱ [U+0F71 TIBETAN VOWEL SIGN AA], ི [U+0F72 TIBETAN VOWEL SIGN I]. Combination used for Sanskrit transcriptions. Do not use. Use instead ཱ [U+0F71 TIBETAN VOWEL SIGN AA], ུ [U+0F74 TIBETAN VOWEL SIGN U]. Combination used for Sanskrit transcriptions. Use instead ྲ [U+0FB2 TIBETAN SUBJOINED LETTER RA], ྀ [U+0F80 TIBETAN VOWEL SIGN REVERSED I]. Combination used for Sanskrit transcriptions. Do not use! Use instead ྲ [U+0FB2 TIBETAN SUBJOINED LETTER RA], ཱ [U+0F71 TIBETAN VOWEL SIGN AA], ྀ [U+0F80 TIBETAN VOWEL SIGN REVERSED I]. Combination used for Sanskrit transcriptions. Use instead ླ [U+0FB3 TIBETAN SUBJOINED LETTER LA], ྀ [U+0F80 TIBETAN VOWEL SIGN REVERSED I]. Combination used for Sanskrit transcriptions. Do not use! Use instead ླ [U+0FB3 TIBETAN SUBJOINED LETTER LA], ཱ [U+0F71 TIBETAN VOWEL SIGN AA], ྀ [U+0F80 TIBETAN VOWEL SIGN REVERSED I]. Combination used for Sanskrit transcriptions. Combination used for Sanskrit transcriptions. Do not use. Use instead ཱ [U+0F71 TIBETAN VOWEL SIGN AA], ྀ [U+0F80 TIBETAN VOWEL SIGN REVERSED I]. Used for Sanskrit transcriptions to represent the anusvara. Used for Sanskrit transcriptions to represent the visarga. May be followed by space characters. Used in Tibetan books on Sanskrit grammar, in ritual texts focused on the Kalacakra ("Wheel of time") system, and in commentaries on the Kalacakra Tantra. Used as a superfix to the letters KA and KHA. Subjoined form is ྍ [U+0F8D TIBETAN SUBJOINED SIGN LCE TSA CAN]. Used as a superfix to the letters PA and PHA. Subjoined form is ྎ [U+0F8E TIBETAN SUBJOINED SIGN MCHU CAN]. See also ྉ [U+0F89 TIBETAN SIGN MCHU CAN]. Subjoined form is ྏ [U+0F8F TIBETAN SUBJOINED SIGN INVERTED MCHU CAN]. Very rare. Used in Tibetan books on Sanskrit grammar, in ritual texts focused on the Kalacakra ("Wheel of time") system, and in commentaries on the Kalacakra Tantra. Head form is ྈ [U+0F88 TIBETAN SIGN LCE TSA CAN]. Head form is ྉ [U+0F89 TIBETAN SIGN MCHU CAN]. Rare. Used in Tibetan books on Sanskrit grammar. See also ྎ [U+0F8E TIBETAN SUBJOINED SIGN MCHU CAN]. The ordinary and inverted forms of this sign are used contrastively in an important 18th century Chinese text, Tóngwén Yùntǒng , which describes the rules for transliterating Sanskrit and Tibetan into Mongolian and Manchu. Head form is ྌ [U+0F8C TIBETAN SIGN INVERTED MCHU CAN]. Stylistic variant of ༄ [U+0F04 TIBETAN MARK INITIAL YIG MGO MDUN MA], used for archaic documents. Head marks appear at the start of the front folio of loose-leaved pechas, to indicate where to begin reading. See Tibetan script notes. See also the Unicode proposal for more information and examples. Stylistic variant of ༅ [U+0F05 TIBETAN MARK CLOSING YIG MGO SGAB MA], used for archaic documents. Head marks appear at the start of the front folio of loose-leaved pechas, to indicate where to begin reading. The head mark may be followed by one or more of these extension marks. See Tibetan script notes. See also the Unicode proposal for more information and examples. Bracket, paired with ༻ [U+0F3B TIBETAN MARK GUG RTAGS GYAS]. Bracket, paired with ༺ [U+0F3A TIBETAN MARK GUG RTAGS GYON]. Paired with ༽ [U+0F3D TIBETAN MARK ANG KHANG GYAS]to form a roof over one or more digits or words. Paired with ༼ [U+0F3C TIBETAN MARK ANG KHANG GYON] to form a roof over one or more digits or words. Can also be used alone much like a single parenthesis in list counters. List enumerator, used at the beginning of administrative letters in Bhutan. Petition honorific, used at the beginning of administrative letters in Bhutan. Performs the role of spaces in English for line breaking. eg. དོན་ཚན་དང་པོ། འགྲོ་བ་མིའི་རིགས་རྒྱུད་ཡོངས་ལ་སྐྱེས་ཙམ་ཉིད་ནས་ཆེ་མཐོངས་དང༌། ཐོབ་ཐངགི་རང་དབང་འདྲ་མཉམ་དུ་ཡོད་ལ། ཁོང་ཚོར་རང་བྱུང་གི་བློ་རྩལ་དང་བསམ་ཚུལ་བཟང་པོ་འདོན་པའི་འོས་བབས་ཀྱང་ཡོད། དེ་བཞིན་ཕན་ཚུན་གཅིག་གིས་གཅིག་ལ་བུ་སྤུན་གྱི་འདུ་ཤེས་འཛིན་པའི་བྱ་སྤྱོད་ཀྱང་ལག་ལེན་བསྟར་དགོས་པ་ཡིན༎. Often referred to as a 'syllable' delimiter, but not a syllable as in English. See also ༌ U+0F0C TIBETAN MARK DELIMITER TSHEG BSTAR. See also ༎ U+0F0E TIBETAN MARK NYIS SHAD. Content authors may also just use two single shays together, if the spacing looks right. See also ། U+0F0D TIBETAN MARK SHAD. If a section of text is actually a gter ma, a single terma symbol replaces both shad ། [U+0F0D TIBETAN MARK SHAD] and double shad ། །. Wood-block pechas sometimes simplify the gter ma, so that it looks like a visarga ཿ [U+0F7F TIBETAN SIGN RNAM BCAD]. Indicates that text should continue as before, similar to 'etc. ', and is used after the first few tsek-bar of a recurring phrase. Application software has to ignore this character for text processing, such as search and collation. See also ◌༷ [U+0F37 TIBETAN MARK NGAS BZUNG SGOR RTAGS]. Used with ྿ [U+0FBF TIBETAN KU RU KHA BZHI MIG CAN] to indicate where text should be inserted within other text or as references to footnotes and marginal notes. Marks the point of text insertion or annotation. See also ◌༵ [U+0F35 TIBETAN MARK NGAS BZUNG NYI ZLA]. Should be used immediately after the consonant it modifies, even if that consonant is followed by a subjoined consonant. This is an integral part of the three consonants ཙ [U+0F59 TIBETAN LETTER TSA], ཚ [U+0F5A TIBETAN LETTER TSHA] , and ཛ [U+0F5B TIBETAN LETTER DZA]. Although those consonants are not decomposable, this mark has been abstracted and may by itself be applied to ཕ [U+0F55 TIBETAN LETTER PHA] (ie. ཕ༹) and other consonants to make new letters for use in transliteration and transcription of other languages. For example, in modern literary Tibetan, it is one of the ways used to transcribe the Chinese “fa” and “va” sounds not represented by the normal Tibetan consonants. Also used to represent tsa , tsha , and dza in abbreviations. Not used for Tibetan text. Used in transliteration of Devanagari to kill the inherent vowel sound of a preceding character, eg. ཛཔ྄ is pronounced ʤap and not ʤapa. Indicates a refrain. Often repeated three times. Used with ༶ [U+0F36 TIBETAN MARK CARET -DZUD RTAGS BZHI MIG CAN] to indicate where text should be inserted within other text or as references to footnotes and marginal notes. Marks the point of text insertion or annotation. Similar to ※ [U+203B REFERENCE MARK]. Variant of ་ [U+0F0B TIBETAN MARK INTERSYLLABIC TSHEG], common in early Tibetan monumental inscriptions and manuscript texts. Sometimes used alongside the normal tsek. It may also be used between shays to mark off the end of a topic, eg. །࿒།࿒།. In some modern texts it has been used to point to the start of a section to which a textual note applies. See Tibetan script notes for more information about use of the tsek. See also the Unicode proposal for more information and examples. The characters in the range U+0F1A-0F1F and U+0FCE-0FCF represent signs used in astrological almanacs. In Tibetan astrology groups of one, two or three black and white pebbles are used for purposes of divination. These are represented in astrological texts by hollow circles (representing white pebbles) and x-shaped crosses (representing black pebbles). This particular combination doesn't occur in most astrological charts, because it is considered inauspicious, but does occur in some. See this Unicode proposal for more information and examples. Paired with ༿ [U+0F3F TIBETAN SIGN MAR TSHES] in combination with digits. Paired with ༾ [U+0F3E TIBETAN SIGN YAR TSHES] in combination with digits. May combine with letters or other symbols. It is typed after the sequence with which it combines. This is a Tibetan-specific version of ࿖ U+0FD6 LEFT-FACING SVASTI SIGN. The svasti signs encoded in the range U+0FD5 to U+0FD8 are considered symbols of good luck and well being. They are widely used sacred symbols in hinduism, buddhism and jainism, and are used religious texts, marriage invitations, and decorations. They are also used on religious flags in jainism, and buddist temples. On maps throughout Asia they mark the location of buddhist temples. The dotted forms are often used in the hindu tradition in India. These characters are located in the Tibetan block, but are intended for general use in other Asian scripts. See also ࿌ [U+0FCC TIBETAN SYMBOL NOR BU BZHI -KHYIL], which is a specifically Tibetan version of this sign. The usage is not certain. By some interpretations, this has the value of 0.5. Used only in some traditional contexts, these appear as the last digit of a multidigit number, eg. ༤༬ represents 42.5. These are very rarely used, however, and other uses have been postulated. The usage is not certain. By some interpretations, this has the value of 1.5. Used only in some traditional contexts, these appear as the last digit of a multidigit number, eg. ༤༬ represents 42.5. These are very rarely used, however, and other uses have been postulated. The usage is not certain. By some interpretations, this has the value of 2.5. Used only in some traditional contexts, these appear as the last digit of a multidigit number, eg. ༤༬ represents 42.5. These are very rarely used, however, and other uses have been postulated. The usage is not certain. By some interpretations, this has the value of 3.5. Used only in some traditional contexts, these appear as the last digit of a multidigit number, eg. ༤༬ represents 42.5. These are very rarely used, however, and other uses have been postulated. The usage is not certain. By some interpretations, this has the value of 4.5. Used only in some traditional contexts, these appear as the last digit of a multidigit number, eg. ༤༬ represents 42.5. These are very rarely used, however, and other uses have been postulated. The usage is not certain. By some interpretations, this has the value of 5.5. Used only in some traditional contexts, these appear as the last digit of a multidigit number, eg. ༤༬ represents 42.5. These are very rarely used, however, and other uses have been postulated. The usage is not certain. By some interpretations, this has the value of 6.5. Used only in some traditional contexts, these appear as the last digit of a multidigit number, eg. ༤༬ represents 42.5. These are very rarely used, however, and other uses have been postulated. The usage is not certain. By some interpretations, this has the value of 7.5. Used only in some traditional contexts, these appear as the last digit of a multidigit number, eg. ༤༬ represents 42.5. These are very rarely used, however, and other uses have been postulated. The usage is not certain. By some interpretations, this has the value of 8.5. Used only in some traditional contexts, these appear as the last digit of a multidigit number, eg. ༤༬ represents 42.5. These are very rarely used, however, and other uses have been postulated. The usage is not certain. By some interpretations, this has the value of 9.5. Used only in some traditional contexts, these appear as the last digit of a multidigit number, eg. ༤༬ represents 42.5. These are very rarely used, however, and other uses have been postulated. [ u ] The Unicode Standard v6.3, Tibetan.